The city-famous Tower wings: this is the Tower Grilled option. Draft options are limited at Tower Bar & Grill. The Tower Grinder and a side of fries. They still make Golden Tee in 2018? Well portioned sliders with a side of fries and smooth, creamy coleslaw. Tower Bar & Grill is located at 2403 W State Blvd. in Fort Wayne. Not all the time. Take The Tower Bar & Grill on West State for example. For years, the small establishment directly across from Dana on W. State Boulevard has been talked about as one of the premier places on the northwest side of town, if not all of Fort Wayne, for chicken wings. Accurate? To each his/her own, but we decided to give our take. Let’s start with the wings. We rolled with what our waitress suggested and got the Tower Grilled bone-in wings over 12 other flavor options. The wings are grilled first, then hit with a mix of garlic and Italian dry rub seasoning that packs a strong “wow” flavor without being overbearing. It was a refreshingly unique taste, but so good that we are gonna spout off about Tower’s superior wings? Not sure about that. We also took a wild shot by ordering some pizza bread. Pizza is good, so you can’t go wrong with pizza AND bread, right? Correct. We actually found this appetizer much more distinct and special than the vaunted wings. A good grinder can be a pub classic if done right. The Tower Grinder isn’t the best grinder ever, but it is a quality sandwich that fills one up on a lunch break. Stacked with ham, salami, pepperoni and capicola, a pleasant surprise is the quality of the produce, including fresh and large tomatoes. A side of house fries makes this a classic selection at most bars, but Tower does it better than most. A wild card is the dipping sauce that accompanies it, which was sweet and…actually, we don’t really know how else to describe it. Hey, no one has mistaken us for being food connoisseurs and we aren’t about to start. The sliders are another bar favorite. While appetizing and filling, nothing truly stands out outside of the fried and diced onions. Oh yeah, and they aren’t your traditional sliders in size, so you certainly are getting more bang for your buck with a side of fries and a rich cup of coleslaw. Are you a millennial looking to try the hot new haze IPA or cream ale? Tower is not your place. This establishment embraces what it is — a watering hole for blue-collar people that just want some beer. Draft options are simple: Bud, Bud Light, Miller Lite and Coors Light. That’s it. The bottle selection leaves a little more choice but doesn’t get too outrageous with a Leinenkugel or a Modelo about as crazy as you’re gonna get. 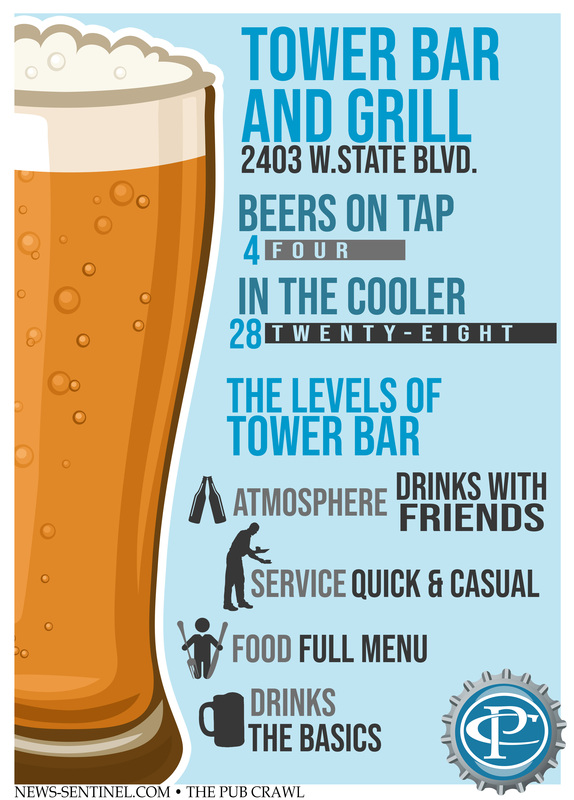 Tower boasts 28 selections out of the cooler, a pretty big list for a place that is more about pairing a beer with lunch or dinner than getting smashed on a Friday night. Or at least smashed on pricey beer. Where you can’t go wrong? A classic Pabst Blue Ribbon, which goes well with any food (just ask your grandpa). Tower also has seasonal Sam Adams selections as well as the ever-popular Yuengling in original or light formats. Beer prices start at $3. A truthful use of the term “there isn’t a bad seat in the house.” Tower is one wide-open room about as square as they come. No hidden nooks or crannies means it’s tough to hide from anyone. Every seat is pretty much as good as any other unless you are bellied up to the bar. If you are a smoker, may we suggest finding a spot close to the State Blvd. door, where not only can you slip out, you are also conveniently located to one of the few cigarette vending machines that must still exist. Looking for some entertainment? Tucked in that same corner is the 2018 edition of Golden Tee. Full disclosure, we didn’t even know they still made Golden Tee. Tower isn’t your traditional late night bar, even if they do stay open until 3 a.m. Peak hours are often between 7 and 8 p.m. where Tower brings in a pretty impressive amount of dinner guests. Shift changes at Dana at 3 p.m. and 11 p.m. also bring in clients. Tower is also a surprisingly popular spot for lunches too, with the majority of the tables taken up even shortly after their 11 a.m. opening. Tower welcomes all, from the working man from across the street to the older couple looking for an early bite to beat the dinner rush. While Tower isn’t really a destination spot to watch the big game, it does have a decent amount of televisions. Don’t expect any loud, overbearing music in the place either, even in the wee hours. The occasional train heading down the siding next to Dana. It doesn’t happen often, but we bet it is a good wake-up call for those who have had a few too many. Tower is nothing to write home about, but that’s exactly why it excels. We don’t always need to try the fancy new beer or be impressed with how many ingredients are in the pasta primavera. At Tower, beer is beer and the bar food is what it is, solid without showing off. When compared to the flashy new fad places around the city, Tower could be considered underwhelming, but is that why it is so appealing? Want a nice, low-key place to kick back after work with coworkers or grab a few drinks with some buddies without getting crazy? Tower is your place. Want to see what Justin and Dan are drinking? Check them out on Untappd, the drinking social network and app for beer enthusiasts everywhere.